Helping victims throughout Washington, D.C. Babies ­sometimes need a little extra coaxing to come into the world. When they do, a doctor may use a vacuum extractor to help guide the child down and through the birth canal. If the extractor is not used correctly, or if there is an underlying defect, your child may have to live with the repercussions forever. At Paulson & Nace, PLLC, we offer comprehensive counsel to clients throughout Washington, D.C. whose children have been injured by a vacuum extractor. Our father-and-sons team of attorneys understands the importance of family, so we focus our energies on protecting birth injury and birth trauma victims. If your child was hurt during delivery, our family wants to help yours. A vacuum extractor uses suction to help move the baby along. A small cup is placed on the infant’s head, and then a pump is used to create a vacuum. For women whose labor has stalled, or for babies who are beginning to show signs of distress or who are not positioned perfectly, a vacuum extractor allows the doctor to speed up the delivery process. This can help save the life of the child and the mother. At Paulson & Nace, we strive for justice on behalf of our clients. We know you have questions; we want to find your answers. Our experiences in product liability and medical malpractice laws make us ideal partners for birth injury cases involving vacuum extractors, because we approach such cases from different perspectives. This allows us to view all sides of the argument and create options for our clients to help them protect themselves and their families in the future. The attorneys of Paulson & Nace are thorough in their preparation of all cases and do not back down in the face of insurance and manufacturing companies. While we want to help you begin the recovery process as quickly as possible, we do not accept low settlement figures just to put your case to bed. Instead, we will fight for your rights, your family and your future in court, and we do not stop unless we know you are safe and satisfied. 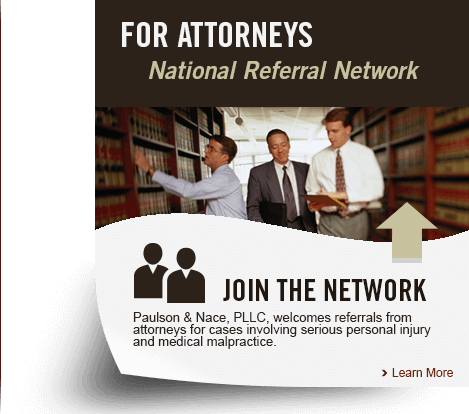 Paulson & Nace, PLLC, is widely recognized and respected throughout Washington, D.C. for our deep-seated desire to do right by our clients. We are your advocates in the courtroom, and we want what is best for you and your family. Please call 202-930-0292 or fill out our contact form if you or your child suffered injury or harm when a vacuum extractor was used during delivery.